Alexandra David Neel was a French-born scholar of Tibetan Buddhism who in 1923, at the age of 55, became the first white woman to enter the forbidden city of Lhasa. She made her long journey on foot, disguised as a beggar-pilgrim and accompanied by her adopted son, a Tibetan lama. Some sixty years later, a middle-aged compatriot and admirer of Neel made two journeys to Tibet, traveling the roads her role model had taken. This is her account of the second trip, which she told as she crocheted a shawl for me. I had been deposited in a town where I didn’t want to be by a truck driver who didn’t want to take me any further after someone had told him about the danger of having an accident if you have a foreign passenger. But I learned in China not to worry, just to trust. I found a hotel, and I went out every day looking for a lift. I heard of a truck leaving the following day for Markham, a town 100 km away on the Tibetan side. The next day I set off. That truck was full of Tibetans. There was also a Muslim from Gansu Province. We took thirteen hours to cover the ground to Markham. We were stopping to buy food, to pick up wool, to visit friends, to deliver things, to take care of breakdowns. I was not pleased at all. When I travel on my own I manage to establish a contact and a rapport with the Chinese or with the Tibetans. As soon as there’s another foreigner, I’m immediately lumped into the “foreigner” category, and it’s not possible to have the same contact with the local people that I had before. The Chinese driver wanted 80 yuan [$27]. It would have been 50 yuan by bus if there had been a bus, but that’s Tibet. Tibet’s about twice as expensive as China. I think it’s because there are very few roads and everything has to be brought in my truck. The Tibetans once had their own traditional food, and they survived very well, but because the Chinese introduced rice instead of barley and that sort of thing, a lot is transported now, and that brings up the prices. The foreigners all went together. The “Americans” turned out to be one Swiss, two English people, and one American. There were twenty-three Tibetans and all their gear—a lot of food, a lot of bags—in this uncovered truck bed. They took up the whole truck. They wrapped themselves up with so many blankets and so many furs, they took up a lot of room. We barely had a place to sit down. Every time the driver stopped—he was really out for the money—more people were waiting to get on. The Tibetans were not nice to us. They resented us, and they were openly aggressive. They have big daggers—they use them to cut their meat—stuck in their clothing. The daggers can dig into your skin when you’re sitting squeezed in next to someone. One of the Westerners complained, and they were very indignant. The next morning we set out early, about five o’clock, because we were going through very, very high mountains. We were traveling at altitudes of 5,000 to 6,000 meters, so it was fairly cold except in the sun. The American boy said he wasn’t going on. He had had enough with just one day in the back of the truck. When I got on, there was nowhere for me to sit. The driver kept picking up more people on the way. The Swiss boy said, “I’m going,” and jumped off the truck. I gave him a packet of biscuits because he had nothing to eat, nothing to drink, nothing. We went on picking up people. The third day—I think—I was too sleepy—I blew my top, and the driver told me again that I was a bad-tempered traveler. He got the Tibetans to make some space for me. By then the two English had had enough of it. They didn’t get on the truck. They just stayed where they were. So I was the only Westerner left. I still five more days to go riding up and down those mountains. As soon as I found myself alone on the truck with all those Tibetans, their change of attitude was amazing. When the last of the other foreigners was gone, they adopted me. I was one of them. They started feeding me. Every time we stopped they gave me some tsampa [a flour made of roasted barley] and tea. They always made sure I had some room, they kept me warm with their blankets, they watched that their daggers didn’t poke me. So we would get up at five, and the truck would have mechanical trouble, and we wouldn’t be off until three in the afternoon. The Tibetans were used to it. They just started lighting the fire, boiling the kettle, drinking some tea, eating some tsampa. It was nice. It was like a excursion into the Australian bush. One day we got up at five, there was the usual breakdown, and at two in the afternoon the driver decided to have a siesta. Some days we had to get up early because the road was so narrow that traffic went in one direction in the morning and in the other direction in the afternoon. The only day we didn’t get up early, the driver was in no hurry at all. Then I discovered we were not far from a town where we had to help build the bridge before we could go across. It frequently happens that the passengers have to get out and push, but having to get out and work on the road doesn’t happen that often. We got out of the truck, and we carried those big heavy boulders. But really, it was a nice break. I wasn’t eager to get back on the truck. The driver had a monkey. He also had a Tibetan apprentice. The apprentice could speak English, Tibetan, Chinese putonghua and one of the Indian languages. Very clever boy. The driver treated him very badly, making him do all the work and calling him stupid all the time. He had to do the driving, do the maintenance and fetch the water for the radiator. When we were eating he always ate very quickly, looking fearfully from side to side all the time. I suddenly realized he was behaving like the driver’s monkey. The driver treated both of them with a mixture of brutality and kindness, feeding them well but then beating them. They reacted in exactly the same way. All the Tibetans were doing business buying goods in one place and selling them in another. The fare was calculated mostly by weight—person plus luggage. Everybody was entitled to about two hundred kilograms of luggage, and I didn’t have any to speak of. I stayed in Lhasa a long time. The old town has those houses with all the bright colors, blue and green inside and out, very Tibetan. I stayed in the old town where the hotels are for the independent travelers. I booked into a hotel I knew had showers. The girl didn’t want to change the bed linen, which was obviously grubby. When you travel in China, and you pay the kind of prices I pay, you don’t look too closely at the linen. But there is a limit. She wouldn’t change it, so I booked out. I went to the next hotel, which did have clean linen. It didn’t have showers, but I could always go to have a shower at the other hotel. I went to Samye, the first monastery ever built in Tibet, with some foreigners from the guesthouse. You have to take a bus up to a point and then you take a ferry across the river—5 mao [17 cents] for the Tibetans, 1 yuan [33 cents] for the foreigners. At Samye the people in the guesthouse didn’t want to put us up, so we ended up asking Tibetan households to give us shelter for the night, going from door to door, knocking and asking. Finally one family took us in. They were very, very nice people. They gave us tsampa and tea constantly. They gave us their bed, and they covered us with a quilt. Their intention was good, but the quilt was filthy. We slept in our clothes. The old lady had a wrinkled face, a dried prune face, but she had a beautiful smile. She spun wool with a little wooden hand spindle which she kept in her pocket ready for any idle moment. She was so beautiful, that old lady. She had a lot of wool in her house, and I thought, “I’ll buy some to make a shawl for my friend.” It looked so lovely then, when it was part of the house. Now it looks as if it needs to be washed. It smells of yak butter. Traveling around, I noticed that frequently the Tibetans would get on the bus and refuse to pay the bus fare. I also found this in Xinjiang. The bus people would have to call public security [the police]. Sometimes they would get on the bus and only pay the fare for the minimum distance and then refuse to get off when the stop came up. I saw some drivers, who were usually Han Chinese, threatening to beat passengers who don’t want to pay. 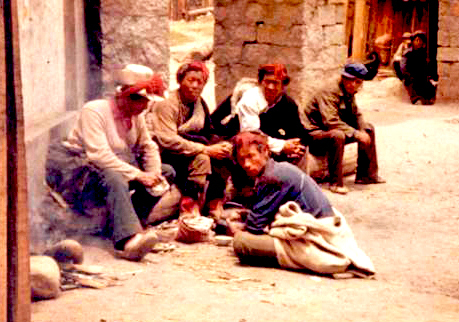 Many Tibetans want to barter goods for the fare. There was one Tibetan who was chucked out because he didn’t pay the 3 yuan fare. We were really in the middle of nowhere. It was ridiculous to be stuck in a place like that. I wasn’t allowed to pay his fare. I suspect it’s a matter of the driver’s loss of face. I didn’t push the point too far. In both Tibet and in Xinjiang you always feel that the situation is very explosive and any altercation at all can result in a fight. Once I saw a driver throw a passenger out of a bus because he hadn’t paid enough. The passenger picked up a stone, and the driver picked up a crowbar. It could have been a bloody situation if the other people hadn’t somehow dissuaded them both from fighting. The Italian boy said, “We’re all running away from reality.” He’d only been in China for two weeks, but he wanted to get back to the reality he had been running away from. His remark hit some nerves. The next day I found one of the English girls in tears. So we talked for a long time about broken relationships and emotional detachment. The truck rolled back like that three or four times on that trip. There was a bridge which was slowly collapsing over a very deep river. The driver told me to get out and cross it on foot. He wasn’t sure the truck would make it. That time I didn’t take any bags at all. I think you have to accept the outcome. You have no control over your situation. Somehow I didn’t find the risk-taking at all upsetting. I found it to be a good experience, maybe a bit of a mystic experience. I would have preferred to die there rather than in a hospital. It would have been a quick death, I’ll tell you. That driver was OK. He was a very, very good driver. You have to be a good driver under those conditions. He also ordered me around all the time—walk, get out, stand up, eat. Do you know what he did throughout the trip? He stopped me from sleeping. Every time I started to doze off he nudged me. I think it was because he didn’t want me to freeze to death in my sleep. Since then I’ve heard of two Australians who froze to death while traveling on that road. I’m sure it’s true. I saw a few Tibetans walking on those roads, going to the monasteries. They pray all the way to Lhasa. I saw two male Tibetans without shoes and with very little clothing, walking in the snow. They looked so serene. They didn’t look as if they felt the cold or hunger or anything. It was marvelous. I thought, “I wish I could be like them, walking the same way.” They seemed so strong and so free of a need for all the material comforts we attach ourselves to. The speaker traveling to Tibet is the same woman who talks about being in Xinjiang on the Old Silk Road. You might want to check the index for that as well. Nichole has either enormous courage or too much naivete. She reminds me of my dear friend Carol – the creator of this wonderful site – and how she headed to China and then Korea to teach so many years ago. I was fascinated by how the attitude of the natives changed when the other “foreigners” were gone. I think it’s connected with the idea of the group as protector and with the sentiment of protecting the weak. You find something similar in Korea.